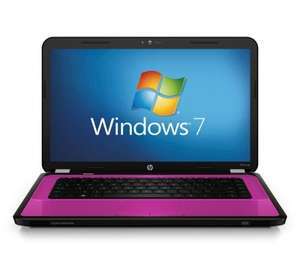 The pink HP Pavilion g6-1243sa 15.6" Laptop is perfect for both work and play. Whether you're on your way to the office or chilling out at home, you'll enjoy powerful processing and impressive operation. This HP laptop has a 2nd generation Intel® CoreTM i5-2430M processor at its heart, offering lightening fast operation. It also features an impressive 6GB of RAM, this combination making for smooth work and play no matter how much you do. Built-in wireless means you can connect to the web at any WiFi location. If you're away from home and want to catch up with family and friends simply turn on the webcam and get some quality face time. Having a conversation doesn't need to go through the keyboard either, the built in microphone will let you chat away till your heart's content. Enjoy a range of entertainment with the HP Pavilion g6-1243sa 15.6" Laptop. With a built-in DVD player you can enjoy music and films on your journeys. Choose between listening through the built-in Altec Lansing speakers with SRS Premium Audio or stick your headphones in for personal entertainment. A battery life of up to 5 hours will give you enough time to work till the last minute on your project or just kick back and relax while you're on your waiting to get to your destination. The HP Pavilion g6-1243sa 15.6" Laptop is an impressive machine, ideal for demanding home, business or school use. heat from me there are other colours available. Also in stock at currys and Dixons. Deal posting newbie! This is rajareddy3g first deal post. Help out by leaving a posting tip or just to show your appreciation for their contribution.